1 You feel the pain of others and have extreme empathy. 2 You notice that strangers open up to you easily. 3 You tend to have vivid dreams often. 4 You need to help people, you don’t see any other way. 5 You can’t stand crowds and feel overwhelmed by them. 6 You’re highly sensitive, and can be emotional. 7 You know you’re a spiritual person. 8 You’re anxious and may have been diagnosed with anxiety. 10 You can feel the energy of others, especially if it’s negative. 11 You’re the friend that people turn to for comfort and support. 12 You love crystals and the healing properties associated with them. 14 You often feel exhausted after social events. 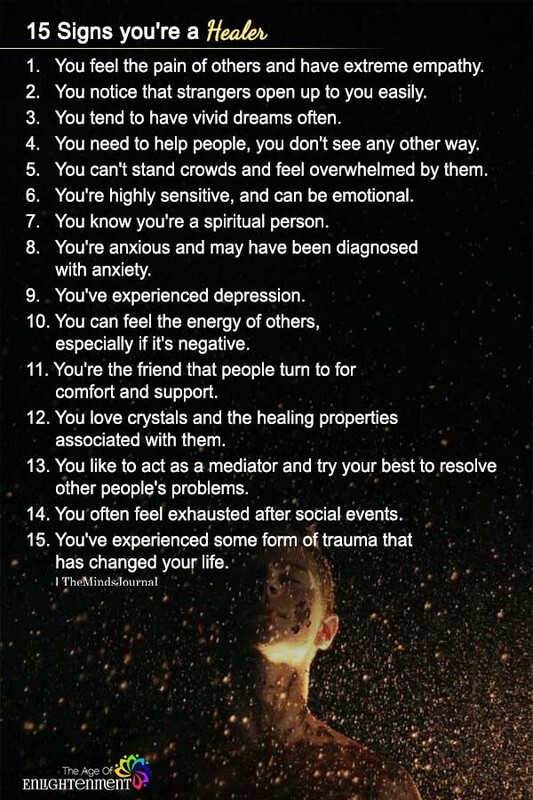 15 You’ve experienced some form of trauma that has changed your life. He wasn’t in my life for 5 yrs. I brought him to hockey games. I don’t know what you think you think he did for me.